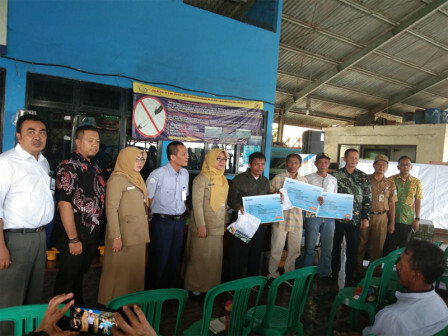 Jakarta Maritime Agriculture and Food Security (KPKP) Department distributes 3,123 insurance cards to fishermen in North Jakarta and Thousand Islands. 1,925 cards are given to 93 fishermen joint groups (KUBE)s in North Jakarta; 1,198 cards to 37 KUBEs in Thousand Islands.
" We want them to be safe while working and doing their activities"
Jakarta KPKP Department's Maritime Division Head, Eny Suparyani explained, her side wants to show Jakarta Government's real commitment and concern in ensuring safety of fishermen and their families. "Fisherman is a high-risk profession. We want them to be safe while working and doing their activities," she explained, Tuesday (2/26). In this case, Jakarta Government hopes economy of fishermen families in Jakarta could be improved by giving assistance. "We want to raise their awareness about the importance of self insurance," she added.